Story and photos by Rick Browne, Ph.B. 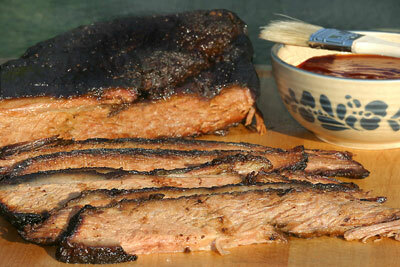 Beef brisket: probably the most difficult cut of meat you’ll ever attempt on a barbecue. But it can be simple; time consuming for sure, but simple. Some claim that cooking a brisket is like cooking a snow tire, but I disagree. Snow tires taste like rubber; perfectly cooked briskets taste like heaven. But in the hands of a savvy pitmaster brisket is tender, drippingly moist, and loaded with real beef flavor that is the essence of barbecue. A perfectly cooked beef brisket is a thing of beauty. 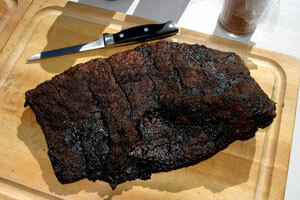 Brisket is the flat cut of meat that runs down the chest of the steer below the short ribs, usually weighing 10-12 pounds, and is sold in three cuts. The most common cut is the “first half,” or “flat.” The flat, which is the leanest portion meat that is at the bottom of a full brisket, is usually sliced and served on a plate or in a sandwich. The triangular “point half,” also called the “point,” sits atop the flat, is separated by a thick layer of fat, and is “fattier” than the flat. Its loose texture makes it better for chopping. The “beef brisket, deckle-off, boneless,” or “whole brisket” has both the flat and point halves together. Now we get down to some brisket cookin’ idiosyncrasies. Some cooks trim off most of the visible fat, including the layer between the flat and point. There are those who trim the fat down to 1/4-1/8 inch overall, and those who leave 100% of the fat on, theorizing that fat melts down through the meat, making it more tender, flavorful and moist. I trim to 1/4-inch. One brisket pitmaster we interviewed for The Barbecue America Cookbook went so far as to cut all the fat off, and then draped it back over the brisket to melt through the meat. Huh? A properly cooked brisket comes out looking like a meteor—dark black and shriveled. But when you stick a fork in it the juices run out like a waterfall, there is a pronounced smoke ring under the surface, and the meat is very tender and loaded with real beef flavor. If improperly cooked—remember that snow tire reference? But how long do you cook the dang thing? 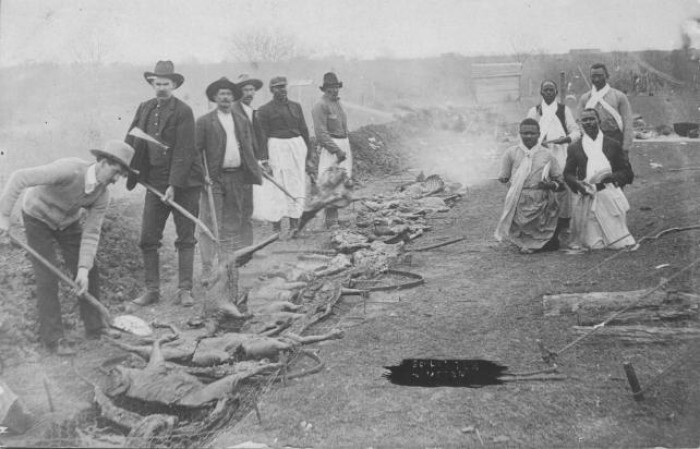 Purists, usually sporting ten-gallon hats and cowboy boots, swear by long cooking times. 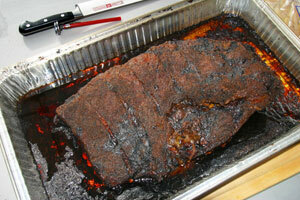 “I’ve never seen a brisket that couldn’t use 24 hours of cooking,” said a Houston pitmaster. There are recipes for 3-4 hour cooking times and suggested cooking times of 18+ hours. I cook brisket for 1 1/2 hours per pound of trimmed meat, to an internal temperature of 185-190 degrees F, measured in the “flat.” The “point” contains too much fat and connective tissue to give an accurate reading. Fat side up or fat side down? Yikes, another choice. Here I usually compromise, starting with the fat side up for the first half of the cooking time, then fat down for the last so the fat protects the bottom of the meat from being overcooked. So your brisket is trimmed and ready to go right? Well, not exactly, you still gotta rub it. A flavorful rub can really enhance the flavor of the beef. 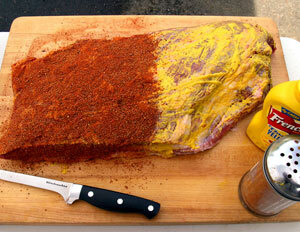 Try this: take some prepared yellow mustard and squirt a liberal amount on both sides of the brisket, then rub it well into the surface with your hands. 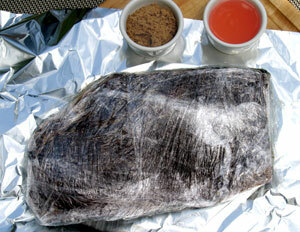 Then massage in a generous amount of dry rub on both sides and dry-marinate for 2-4 hours. I take the meat directly from the refrigerator to the grill—despite those that think it should be brought to room temperature first—and have been happy with the results. Place the meat on an unheated side of the grill. If you are using charcoal, have the charcoal on one side of the grill only; if using gas, light one burner and leave the other one(s) unlit. Cook over indirect heat only, no direct flame. 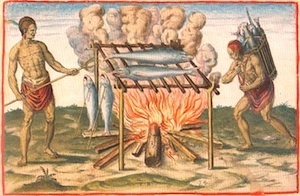 I like to cook between 225-250 degrees F to reach an internal temperature of between 185-190 degrees. Then I make up a basting spray, which I will use a couple of times per side to add some moisture and flavor. But don’t spray during the first three hours, otherwise you’ll wash away the rub. Lift the lid and spray quickly so you don’t lose too much heat. NOTE: Whenever you lift the lid of a barbecue you can lose up to 15 minutes of cooking time, especially in a charcoal grill or smoker. When the brisket has reached the desired internal temperature, remove it from the grill and wrap it in plastic wrap and then in aluminum foil, and place it in an empty ice chest for 1-2 hours. The plastic wrap ensures that the juices will retreat into the center of the brisket, helping to give you the moistest slices you can imagine. Remember the Seinfeld “Shrinkage” episode? 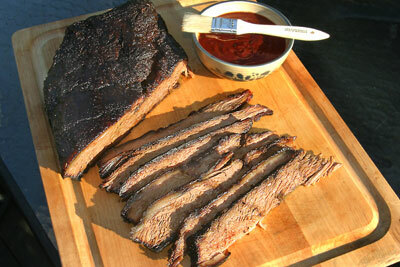 You will find that shrinkage applies to brisket too, as the meat will have lost anywhere from 40-60% of its weight. But the charred, shrunken piece of protein that remains will have 110% flavor, tenderness, and moisture, well worth the tender care you’ve given it on the Que. If you’ve cooked a whole brisket (flat and point), you must separate these two parts, reserving the point for chopping and the flat for slicing. When you slice the flat cut diagonally across the grain in 1/4-inch slices, the meat should pull apart easily while still having a nice texture. If it falls apart, it’s overcooked. So give it a shot, buy a quality brisket, spend the long prep time—it’s worth it. Cook it up low and slow, and serve sliced or chopped at your next BBQ party; you’ll be guaranteed to have the best tasting snow tire (er, sorry, brisket) on the planet. Brisket after 3 hours of cooking. Combine all marinade ingredients. 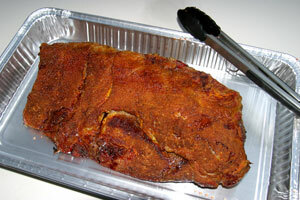 Marinate the brisket for 2 days in refrigerator. Combine all rub ingredients and store in a sealed container. Squirt mustard liberally over both sides of the meat and rub it in with you hands. Sprinkle generously with the rub and pat into the meat. Let dry-marinate for 3-4 hrs. if possible, or at least one hour. Brisket after 16 hours of cooking. Place brisket in a smoker, fat side up, and cook for about 1/ 1/2 hrs. per pound (this usually turns out to be about 16-18 hours) at 225-250 degrees F.
While meat is cooking boil the marinade for 12 minutes then cool and put it into a spray bottle. After 3 hours of cooking time spray the meat and turn, and repeat every three hours. When the meat reaches an internal temperature of 185-190 degrees F remove it from the grill, wrap in plastic wrap, and then wrap in aluminum foil and place it in an empty ice chest for 1-2 hrs. Serve thinly sliced with BBQ sauce on the side. Wrapped brisket ready to rest. Heat oil in a large, heavy saucepan over medium-high heat. Add onion and saut until golden brown, about 6 minutes. Add vinegar and boil until mixture is reduced to 3/4 cup, about 5 minutes. Remove from heat. Add ketchup, molasses, and 1/4 cup water, then the bourbon; stir to blend. Bring the sauce to a simmer. Stir in salt and white pepper. Simmer for 10 minutes to blend the flavors. Serve brisket with a side of rich, spicy BBQ sauce. In a large mixing bowl gently combine the beans, mandarin orange slices, raisins, apple, cane syrup, Sprite, onion, mustard, spices, ketchup and orange juice. Pour mixture into a large cast-iron skillet. Cover the skillet with aluminum foil and put into a BBQ (or oven) and bake at 300 degrees F for 1 hour. Remove the aluminum foil cover, then cover the beans with rounds of ready-to-cook refrigerated biscuits and bake about 10 minutes longer, or until the biscuits puff up and are browned. Serve the skillet at the table, giving each person a spoonful of biscuit and a heaping portion of beans.